Every region, doubtless, has its list of interesting individuals around whom stories cluster. Those who travel over the Virginia-Maryland countryside frequently encounter signs like “Washington Slept Here.” One man, statistically inclined or wishing to appear humorous, insisted that all such claims could not be true. He contended that their combined total would be greater than that of all the nights which Washington spent away from Mt. Vernon. True or untrue, such signs do indicate a desire to connect a locality with some name great in our history. These local associations intensify the feeling that the men connected with past events were real. Washington did not come so far west as Illinois, so we cannot erect a “Washington Slept Here” sign. Nevertheless, this region can claim some rather close associations with the great Virginian. One early contact between Washington and men from southern Illinois occurred when unwelcome visitors from here paid a call upon him in 1754. Among these callers were “100 choice troops” with some Indian allies from present-day Randolph County. It came about in this way. British and French interests had for many years been in violent conflict in various places over the world. The American part of this conflict is known as the French and Indian Wars. In our country it was a struggle for control of the heart of the North American continent. A common objective of both parties was control of the Ohio Valley. The French were in the region early in force and established Fort Duquesne at the site of present-day Pittsburgh. The British, represented by a force of Virginia militia under the command of George Washington, arrived in the same area soon afterwards, intending to establish a fort and thus control the region. When he found the French already there, Washington built a second fort at Great Meadows, not so far away, and named it Fort Necessity. The French immediately began to gather forces to drive the Virginians away. It was to this gathering of French forces that Major Makarty, commandant at Fort de Chartres in Randolph County, sent a hundred troops accompanied by Indian allies. Other French troops and Indians were sent from Vincennes to join those coming from posts in Canada. When sufficient French forces had gathered, they attacked Washington and forced him to surrender Fort Necessity at Great Meadows, not Confluence, Pennsylvania, on July 3, 1754. The callers from Illinois contributed to Washington’s defeat. By a strange coincidence this surrender occurred exactly twenty-one years before the day on which Washington assumed command of the Colonial Army at Cambridge, Massachusetts. This sending of troops to attack Fort Necessity does not constitute the only association of Washington with men in our story. 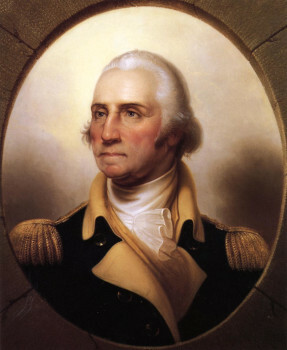 A year after the surrender of Fort Necessity, Washington returned to that same vicinity as an aide to General Braddock, commander of British forces sent to occupy that area. The defeat and death of General Braddock and the able services of Washington in rescuing the troops from utter destruction, as well as the part played by the Indian allies of the French, is well known. These Indians, the element that apparently determined the defeat of the British, were directed by Chief Pontiac who later was killed at Cahokia, just south of East St. Louis. Another man close to Washington came to live at New Haven, in Gallatin County. He had served as Washington’s personal baggagemaster during the Revolution and perhaps knew Washington as intimately as it was the privilege of any man to know him. This baggagemaster is buried in a marked grave in the little cemetery about three miles west and two miles north from the Wabash River village. Another and a better known man associated with Washington ended his days at Shawneetown. This was General Thomas Posey, distinguished alike from his military achievements and as a state and governmental official. After all, southern Illinois can claim definite, but tenuous connections with Washington.